In 1990, Bowater, Inc. commissioned Linda Arnold Miller to illustrate all aspects of their Calhoun, TN operation in one image. The original idea was to give the pictures to area schools as a poster. When the project was completed, the executives wanted lithographic prints of “The Bowater Working Forest” for themselves and as gifts to visiting officials. 500 lithographic prints were printed and 400 were offered for sale which quickly sold out to employees and collectors. Linda Miller retained the Artist Proofs and is now offering the remaining few for sale at $250.00 each including shipping and handling in US. 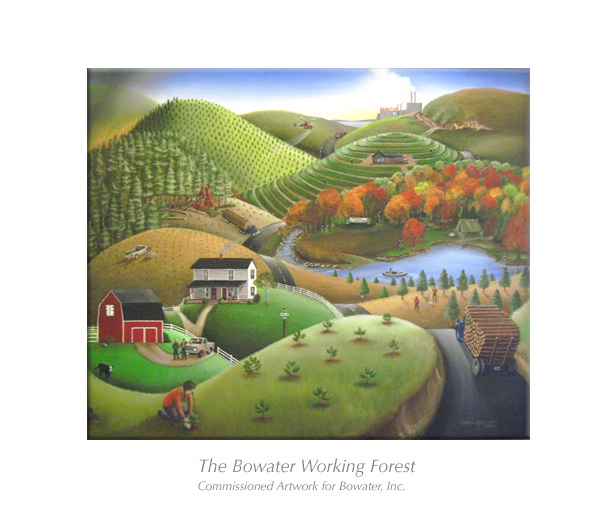 The Bowater Working Forest print depicts a tree nursery, planting trees, harvesting trees, the paper manufacturing plant, recreational facilities, Pocket Wilderness, and more. To order a print, click here.